Making the Cut – An Intro! That deck is why I’m writing for you today. 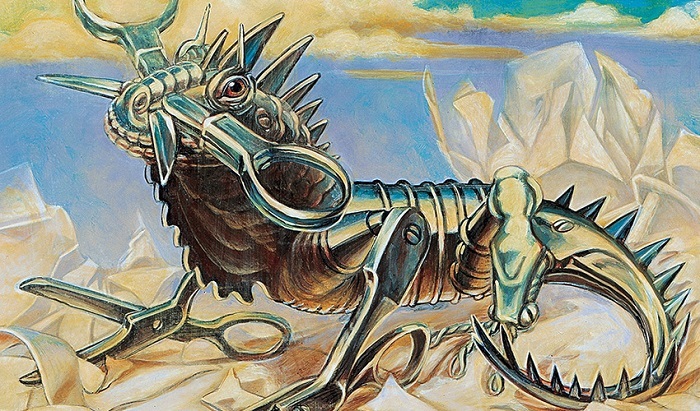 Over eight years, it has gone from a pile of literally all creatures with an average converted mana cost of approximately 17 to a streamlined monster that will sacrifice and recur Gray Merchant of Asphodel, Solemn Simulacrum, and Kokusho, the Evening Star three times a turn while wiping your whole board with Phyrexian Plaguelord. So as you might imagine, the deck has gone through some revisions. This means there’ve been many times I sat down with a stack of six cards I think might be good in the deck… but had no idea what to cut. That feeling of indecision is exactly what this series is about. Getting your deck down to the prescribed 100 cards is not an easy task, and keeping it there as it evolves doesn’t get any easier over time. The “just cut a land” ideology is rather cathartic in the short term, but it gets problematic when enacted multiple times. Rather than throw my weight behind that tactic, instead I’d like to get to the heart of some of the issues that crop up when you’re sitting there with a pile of cards in front of you that all seem necessary and excellent. Looking through the Top 100 Creatures on EDHREC, we can see many friendly faces that have ended up in various Golgari decks over the years. When this specific deck was first made and EDHREC didn’t exist, however, Elder Dragon Highlander as a whole was a much more Timmy/Tammy environment than it is now. That meant that instead of playing Deathrite Shaman and Blood Artist, I was playing a lot more Avenger of Zendikar, Terastodon, and Butcher of Malakir-esque cards in the 6-8 mana range. I was also backing those up with even more creatures outside the top 100 list that were also in the 6-8 range, like Panglacial Wurm, Pelakka Wurm, and Wurmcoil Engine (I had a bit of a Wurm thing, I think). Now, to be clear here, there is nothing wrong with playing any of those cards in any deck. In fact, many of those cards are still in my “Oops, All Creatures” deck to this day. They’re big and they do fun things, which, for a lot of us, is exactly what Commander is about. Still, at a certain point, as my playgroup evolved, more and more I noticed that I was sitting there on turn six with only my Commander and a mana guy in play and five expensive creatures in my hand, while others around me were already starting to put together win conditions. So, I set about cutting down the mana cost of the deck, as many of us do when we want a deck to go up in power level. So. I just listed six expensive creatures above. Which do you cut? What do you include instead? Let’s take a look at a few of these expensive creatures, and other creatures that do similar things for less mana. Replacing Pelakka Wurm: Thragtusk or Filigree Familiar? Pelakka Wurm is a fine card, if a bit expensive. It’ll gain you some life upon entering the battlefield, maybe get to swing in, and upon death will replace itself with another card. Thragtusk is similar, only it gives you another creature on death instead of another card in hand. Filigree Familiar, on the other hand, does a great Pelakka Wurm impression, while being much cuter and ultimately probably much less impactful. So how low are we trying to make the mana curve, while taking into consideration how much bang for the buck is still needed? On initial look at this topic, I’m sure many of you scoffed at this even being a competition. 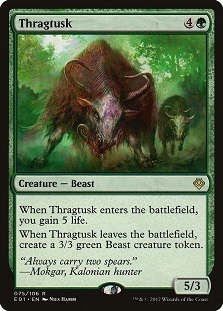 Thragtusk is a manageable five mana for five power and five life, and it gets you a 3/3 when it shuffles off the mortal coil. Given that we’re talking about decks playing with sacrifice effects and graveyard shenanigans, it’s pretty hard to beat that. It could also be great if you’re not the one killing your creatures, but rather an opponent casts a board wipe and you end up with a blocker still in play. In short, Thragtusk is a value powerhouse priced in a reasonably median area of the mana curve. Filigree Familiar, however, is substantially cheaper at three mana, and still gains you life upon entering and draws you a card upon leaving. You still get lots of value out of recurring it several times, and you can cast it early without any problem whatsoever. Being an artifact, you also don’t have to worry about any possible mana fixing issues, in addition to this being an ace in the hole if you get stuck on three lands. Basically, Filigree doesn’t do what Pelakka Wurm and Thragtusk do as far as affecting the game, but it will make it into the game and have an effect, even in much more powerful metas. Still, if it were up to the deckbuilders at large, Thragtusk is the favorite overall, already seeing play in 3,873 decks, as opposed to Pelakka Wurm’s 1,713 and Filigree Familiar’s 2,178. It must be stated, however, that those numbers absolutely pale in comparison to Sad Robot’s 67,013 decks. That’s probably correct; all of these creatures should be a backup to his might, not a replacement. So the decision really does come down to what your deck in your meta needs more. A small, easy to cast Fox that will gain you some life before it chump blocks/gets sacrificed to draw a card, or a large Beast that may get stuck in your hand but will ultimately impact the board and your life total much more if it does make it into play? How Many Tokens is Enough Tokens? 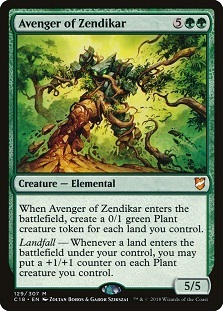 It’s hard to overstate how devastating an Avenger of Zendikar hitting the battlefield can be. Suddenly there are at least half a dozen plant tokens, and odds are they’re going to get bigger soon. Add a sacrifice effect like Krovikan Horror to the mix or an Abyss effect like Woebringer Demon, and you’re going to have opponents tripping over themselves to find a board wipe. But really, do you need Avenger of Zendikar to do that? Couldn’t you get some tokens for less initial investment? Well, for one less mana there’s a plethora of options like Grave Titan, Rampaging Baloths, and Izoni, Thousand-Eyed, but all of them take time, probably make substantially fewer tokens, and can be situational. So instead, let’s go further down the mana curve. While neither generate tokens upon entering the battlefield like the seven-mana favorites Hornet Queen and Avenger of Zendikar, there is no disputing that if you’re looking for quantity in tokens at a cheaper mana cost, both Ogre Slumlord and Endrek Sahr can do it for you. (There is also an argument for Mycoloth here, but it requires you to already have a board state). Both cost five mana, and like most creatures in a Golgari recursion deck, they aren’t particularly skittish about the graveyard. For Endrek, that means that he’ll put himself there if too many tokens end up on the battlefield at once. Given that you get tokens equal to the converted mana cost of each creature spell you cast, this is easy to do. For the Slumlord, that means the more nontoken creatures that die, the more tokens you’ll get. 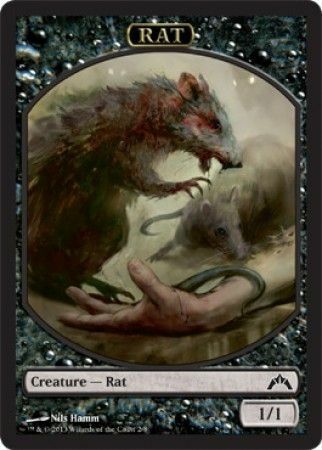 The fact that those Rat tokens also get deathtouch makes that cycle a bit easier to maintain. The argument here basically boils down to what you’re looking to do more: Cast creatures or kill things. If your deck leans toward killing creatures at every turn, whether that be through board wipes or sacrifice effects, then it’s hard to argue against Ogre Slumlord (especially since a board wipe means you have creatures and no one else does). And indeed, the deckbuilders do appreciate this particular effect, having put him in 3,087 decks. Given that he’s only $1.29 rather than the $4.00 you’d pay for an Avenger of Zendikar, it is a bit surprising that he hasn’t ended up in more decks. Believe it or not, however, Endrek, probably in spite of his $0.35 price tag rather than because of it, is still the more popular of the two choices. Ending up in 3,631 decks isn’t such a surprise, because even if you do care more about killing your own creatures, Endrek works beautifully with sacrifice outlets. It is extremely easy to cast a creature spell costing four mana, creating four tokens, then sacrificing all of them for value before casting another creature spell for three mana and getting three more tokens. Even in the case that you do end up killing him, you’re luckily already in a deck that specializes in bringing creatures back from the graveyard. So really the biggest restriction here is that his ability only triggers when you cast a creature spell. This means that if you’re more focused on killing creatures with noncreature spells, or setting up fantastic loops of creatures going from the graveyard to the battlefield and back again, that the needle may indeed lean back a bit toward Ogre Slumlord. If you’re more focused on being a deck that casts a lot of creatures, some of which happen to mess about with the graveyard and recursion and sacrifice effects, then Endrek Sahr might be the better choice. Either way, you’re still going to be able to reliably make tokens earlier in the game than you might be able to with the big splashy Avenger of Zendikar. So, which would you choose for your deck? Let me know in the comments below! I’d also love to know what strategies you use to cut cards and mana costs. What cards are currently mulling about unsleeved in your deck box? Let me know in the comments so we can all help each other get to 99.